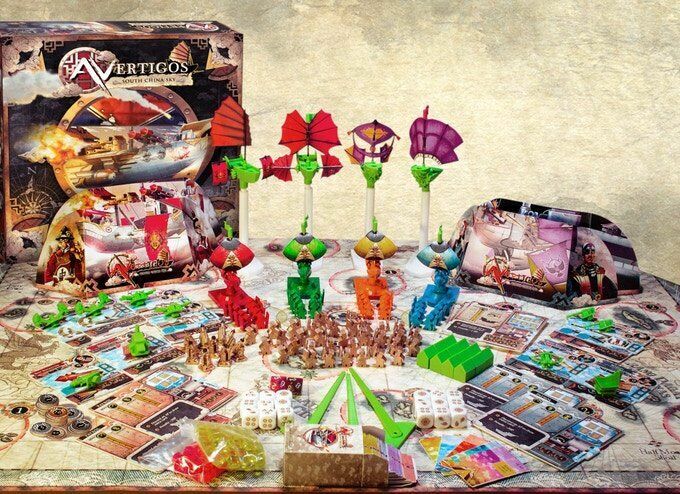 Avertigos- A 3D Boardgame with Flying Sail-Ship Miniatures is a unique Board Game with moddable Sail-Ships engaging in innovative 3D Tactical manoeuvres on the Table top. This science fiction story takes place in an alternate history of our world. In this first installment, the action takes place in the South China Sky, where the Dynastic naval armada is facing off against the combined fleets of the Singasari League to exert supremacy over strategic islands and control rich trade routes plying exotic goods. Playware have set up many options so that their backers can start their collection in the way that suits them most. The simplest way to start is with the Base Game. This has everything you need to experience the world of Avertigos.